We are starting the HP Application Lifecycle Management (ALM) Quality Center (QC) tutorial series. This will be a complete online training in 7 in-depth tutorials. We have listed all HP ALM tutorials on this page for your convenience. This first tutorial will give you a complete overview of the tool along with simple examples and concerned screenshots for your easy and better understanding of the tool. It's recommended you follow these tutorials sequentially. I'm sure, once you are done with reading, you won't need any other training to start using this tool on your projects. HP ALM is a software that is designed to manage the various phases of Software Development Life Cycle(SDLC) right from requirements gathering to testing. Earlier, it was known as HP Quality Center (QC). HP QC acts as a test management tool while HP ALM acts as a project management tool. HP QC is named as HP ALM from version 11.0. I am sure that this tutorial will really be a guide to those who are new to this tool. Provides integration with external tools such as HP UFT for automation testing and HP Load Runner for performance testing. Visibility of the project status to all stakeholders of the project. Reduces risk associated with managing several artifacts of the project at various phases. Release Management: To achieve traceability between test cases to release. Requirement Management: To ensure if the test cases cover all the specified requirements or not. Test case management: To maintain the version history of the changes done to test cases and act as a central repository for all the test cases of an application. Test Execution management: To track multiple instances of test case runs and to ensure the credibility of the testing effort. Defect Management: To ensure if the major defects uncovered are visible to all major stakeholders of the project and to make sure the defects follow a specified life cycle till closure. Reports Management: To ensure if reports and graphs are generated to keep a track of the project health. Project planning and Tracking: This tool allows the users to create KPI’s (Key Performance Indicators) using ALM data and tracks them against the project milestones. Defect Sharing: This tool provides the ability to share defects across multiple projects. Project Reporting: This tool provides customized project reporting across multiple projects using pre-defined templates. Integration with third-party tools: This tool provided integration with third-party tools such as HP LoadRunner, HP Unified Functional Testing and REST API. HP QC was earlier known as Test Director, which was a product of Mercury Interactive. Later, Test Director was acquired by HP and the product was named as HP Quality Center. 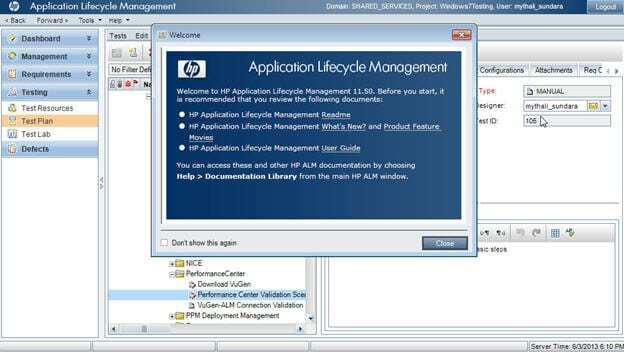 HP Quality Center was named as HP Application Lifecycle Management from version 11.0. The below diagram explains a high-level view of the architecture. HP Application Lifecycle Management tool uses Java Enterprise Edition (J2EE) technology and Oracle or MS SQL server at the backend. HP ALM Client is the browser using which a user can access this tool. When a user tries to access ALM using its URL, HP ALM client components will be downloaded to the user's local machine that helps the users to interact with HP ALM Server. A load balancer is also used to cater multiple requests from the users at the same time. Application Server is the ALM Server that a user interacts with. The application server uses Java Database Connectivity(JDBC) to cater to the user requests. ALM database server stores all the project related information such as project reports, project users etc. Site Administration database server stores all the information related to the domain, users, and projects. HP ALM is the main product with all available ALM features. HP ALM essentials edition provides the basic features to the users such as requirements, test plan, and defects. HP QC Enterprise edition is for the users who want to integrate ALM with HP Unified Functional Testing to drive automation scripts through ALM. HP ALM Performance Center edition is used for the users who want to integrate HP ALM with HP LoadRunner to driver performance tests through ALM. Creation of test cases directly on this tool is a time-consuming process. Hence importing test cases from Excel to this tool can be done using an Excel Add-in. #1) Download the HP ALM Excel add-in from here. The below web page will open up. #2) Click on the ‘GET IT’ button. Download this add-in based on the ALM version installed. #3) A ZIP file will be downloaded. Extract the contents of the ZIP file to a file folder. #4) Double click on the ‘ALM_Excel_Addin_Setup.exe’ file. An Installation wizard opens up. #5) Click on the ‘Next’ button, the below screen will appear. #6) Once the extraction is complete, the below screen will appear. #7) Click on the ‘Next’ button. Once the installation is complete, the below screen will appear. #8) Click on the Finish button, and the below screen will appear. Click on Finish button on the Install shield wizard. #1) Open the excel and verify the display of the tab ‘HPE ALM Upload Add-in’. #2) Click on the Login button. #3) Provide the authentication details and login into ALM. ‘Open’ and ‘Mapping’ options must be enabled once the login is successful. #4) We need to map the columns of our excel sheet with the corresponding fields on ALM. To achieve this, Click on ‘Mapping’. The below screen will appear. #5) Select the option ‘Tests’ from the drop-down. If you have an existing mapping file, you can select the ‘Open’ button and import the file. Also, there is a feature named ‘Auto map’ that automatically maps the columns on the excel to the fields on ALM. #6) Below mapping, a window appears, in which you need to provide the column alphabet of the excel with the corresponding fields on ALM tool. #7) Once the mapping is complete, click on the ‘Validate’ button. The message saying ‘Validation has passed’ will appear. Finally, click on the ‘Upload to ALM’ tab. A defect is raised when there is a deviation between the actual result and the expected result. Defect lifecycle defines the phases through which a defect has to go through during its lifetime. The number of phases and the phase description differs from organization to organization and from project to project. In general, a Defect in ALM tool will go through the following phases. #1) New: A defect will be in New status when a defect is raised and submitted. This is the default status for every defect initially on HP ALM. #2) Open: A defect will be in open status when a developer has reviewed the defect and starts working on it if it is a valid defect. #3) Rejected: A defect will be in Rejected status when a developer considers the defect to be invalid. #4) Deferred: If the defect is a valid defect, but the fix is not delivered in the current release, a defect will be postponed to the future releases using the status Deferred. #5) Fixed: Once the developer has fixed the defect and assigned the defect back to the Quality Assurance Personnel, then it will have Fixed status. #6) Retest: Once the fix is deployed, Tester has to start retesting the defect. 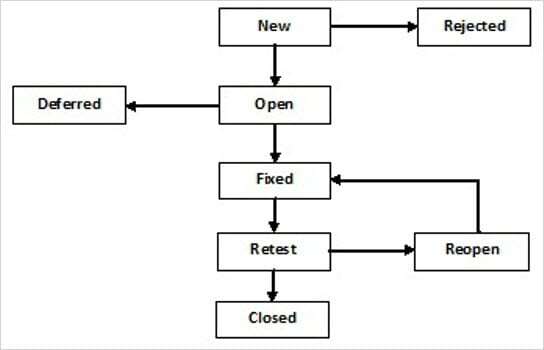 #7) Reopen: If the retest has failed, a tester has to reopen the defect and assign the defect back to the developer. #8) Closed: If the defect fix is delivered and is working as expected, then the tester needs to close the defect using the status ‘Closed’. Filter on HP ALM is used to filter the data based on each of the fields displayed. The filter is available on Requirements, Test Plan, Test Lab and Defects modules. Filter criteria on Test Lab module will appear as below. Select a field and apply the filter condition as below. Logical operators such as AND, OR etc. can be used during filtering. Find functionality is used to search for a specific item. Item can be a requirement, test case, test set, a folder or a subfolder. It is available in Releases, Requirements, Test Plan, Test Lab and Defects modules. Below is the representation of how the find dialog box appears. Click on the Find option. Find dialog box appears there, using which the users can enter a search term and find the required item. Below image represents the search results screen displayed. Replace functionality allows the users to find a specific item and replace it with a new value. Replace functionality is available on Releases, Requirements, Test Plan, Test Lab and Defects modules. Below image is the representation of how the replace window looks like. Click on Replace All option, enter an item to be replaced and click on ‘Replace’ button. The below window appears once the replace operation is successful. Send Email functionality is available on all the modules of this tool. Users can access send email functionality by clicking on the ‘Email’ icon. The users can customize the content of an email to be sent based on their requirements. To: Users can enter two or more email addresses separated by a semicolon. CC: Users can enter two or more email addresses separated by a semicolon. Subject: Subject field is auto-populated on the tool based on the selected item. However, users can customize it as per their requirements. Additional Comments: Users can enter any additional comments if required using this field. This tutorial covers HP ALM Quality Center introduction, installing ALM, and understanding different components. HP ALM formerly known as Quality Center is a Test Management tool to manage entire Quality Assurance and testing process for an organization. Before being called HP Quality center it used to be Mercury Test Director. In my experience, I have come across very few projects (Manual and Automation) that did not use Quality Center software. It is a very simple tool to use, extremely user-friendly. Even if you have never used it before, chances are you will be able to figure out how to in a really short time. However, there is a lot of difference between being able to navigate through the tool and being able to exploit its potential to benefit your project. So here is a tutorial to easily learn Quality Center capabilities and use them successfully. Download HP ALM/QC Trial (Now Micro Focus Application Lifecycle Management (ALM) software): The current latest HP ALM version is 12. => Here is a detailed tutorial on HP ALM Quality center download and installation. It is a little tricky to install it on your local machine. But you will be able to do so if you have a compatible machine and understand the components ALM has. Each component has a certain version that is compatible with ALM. Define and maintain requirements and tests. Integrate ALM with HP testing tools other third party tools for a complete automation experience. Step #2: Click “Application Lifecycle Management” in the below window. Step #4: Choose the Domain and Project as required and click “Login”. Once you are logged in, ALM window opens up and displays the module in which you were working last. The domain is nothing but a logical division of departments for your organization. Example: Banking, Retail, Health Care etc. Projects are the different teams working within the domain. For example in a Retail project, they could be working on the front end store Point of sale app or the back-end inventory module. The Domain and Project information is set by the ALM Admin. Step #5: The user domain, Project, and user information is displayed in the upper right-hand corner. Also, notice the sidebar. It contains the components from the ALM flow. ALM is all about these components and we will learn what each one is for. Even though Dashboard is the first in the list, we will discuss it last in our series, simply because it is an overall monitoring feature and it will be more practical to see the data that we actually create. I hope that this tutorial would have given you a great insight of HP Application Lifecycle Management tool. HP ALM is one of the most widely used tools among testers. The simplicity and ease of using this tool make it the ideal choice for many organizations worldwide. This tool can be used in two ways either as a desktop application or on a cloud. As desktop application requires a tedious process of download and installation of HP ALM on local machines, an on-premise cloud is generally preferred for business purposes. In next tutorial #2, we will cover HP Quality center installation. Later, we will continue HP ALM QC training by taking an example of Gmail application. This session will cover what this tool can do for your project and how best you can manage all your testing related activities in one place. Are you aware of other interesting facts about this tool apart from the ones mentioned above? Feel free to share your thoughts. I Have QTP 10 installed on my computer having Windows XP, Please tell how can i install QC on Windows XP and QC 11.5 works with QTP 10…if no which version of QC is works with QTP10..also Please tell how to install QC on Windows XP. Really , It will helps a lot to freshers….!! Thanks to faculty & Blogger Admin…! Excellent article for freshers… Thanks a lot..
Good Artical about Application Life cycle Management. it is posible to enlist the new features of ALM over QC10.0? Very nice article to learn for everybody. After using QC for a few years, I had to relocate and its been a while since I have used QC… It will be nice to refresh with this tutorial ! I am a fresher,please tell me more about Quality center and the interview question based on QC. good article… very simple language, easy to understand. @Sahil: We are coming up with an article for QC installation. If you follow the steps in that you can install it easily. For QTP integration you will need a QTP add in for QC. @Naresh gupta: There is not much of a feature change in the new version than the earlier one, it is only an enhancement. New enhancements are: emails from test instances and test runs. Ability to send parameter values in an email. There are other changes w.r.t installation etc. whaere is the day2 material????? Anybody knows QTP Certification centers in Kerala ?. @VENKATESH – this is first tutorial (day 1) in this series. You will get other tutorials in coming days. We are giving some time in between every tutorial so that all readers can catch up whenever it’s convenient for them. Our aim is to teach you Quality Center in approx 4 tutorials, where if you just spend 1 day for each tutorial you should be good to start working on it! I have folowed Day-1 training. Could you please let me know when will the second tutorial will be published? @Mahesh: Soon Mahesh. We are giving some time between the tutorials so that the readers have time to catch up. Good luck with QC! @Revathy: the articles are coming up, please stay tuned! @Mahesh: ALM client is compatible with Windows 7 but the server is not. So, I am guessing you encountered this error while you were configuring the server. Is that right? Can u please also add a tutorial about how to integrate QC with QTP and how to run test scripts from QTP please!!!!!!!!!!!!!!! @Rajesh: ALM is the new version of QC(from version 11 onwards). They are essentially the same, except that ALM has a few additional features because it is newer. consistent processes, shared best-practices, and asset sharing across projects. that is the link for the QTP tutorials. All the best and feel free to reach out to us in case you have any questions. Good luck and feel free to get back to us in case you have any questions. Trials version of ALM tool of evolution is free of cost for 60 days right? Can anybody confirm trial version of ALM Evolution tool is free of cost right. @sayed: yes, evaluation is free for the first 60 days of trial. thankyou Vijay and Swati… cant thankyou enough for this. Is there any QC Tutorials (like the QTP, ) that i can check out? Excellent…Tutorial. I have never seen this kind of stuff. On QC there is a provision to capture pictures of the documents. I need help with that features. Does Microsoft Outlook have anything to do with loading ALM? I received a funny message asking for Outlook. i lost pratice on qc from two years.. it will be very help full if i get full information to pratice.. and i have qc 9. and laptop of gt575 of lenovo. i am unable to install qc in it.. is there any other option i can install qc in my pc..
Do you know if you can share requirements across projects? For instance, my team has high level requirements/parent requirements that are used for all projects.